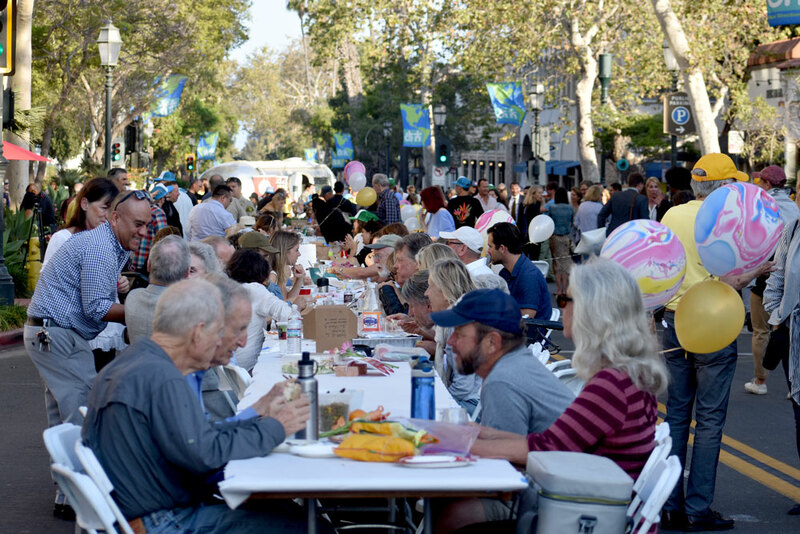 A big communal table seating hundreds of residents dominated the 1200 block of State Street in downtown Santa Barbara Thursday evening during the "Our Common Table" gathering. Guests at the outdoor-dining event sat beside friends on a night out, visitors from out of town, first responders and families. The Lois & Walter Capps Project, in partnership with the Santa Barbara Downtown Organization and the city of Santa Barbara, shut down State Street, between Victoria and Anapamu streets, for about two hours to host the potluck dinner. The sole purpose of the event is community building, Lois Capps, who helps organize the communal dining experience, told Noozhawk. The community get-together featured live music in front of the Granada Theatre, and dining options included area vendors, or residents brought their food to eat. Sitting nearby the Santa Barbara Celadon House retail store and munching on dinner, Pam Gunther brought organic apples to share. Jennifer Bochsler, a Santa Barbara resident since 2009, said she approves of the temporary street closure on State Street. Members of the Santa Barbara County Fire Department, Santa Barbara City Fire Department, Santa Barbara County Sheriff's Office and Santa Barbara Police Department also were in attendance.